If you care about Drake, Cardi B and Post Malone more than you care for tinsel, mistletoe and candy canes, we've found the perfect Christmas jumpers for you. 1. 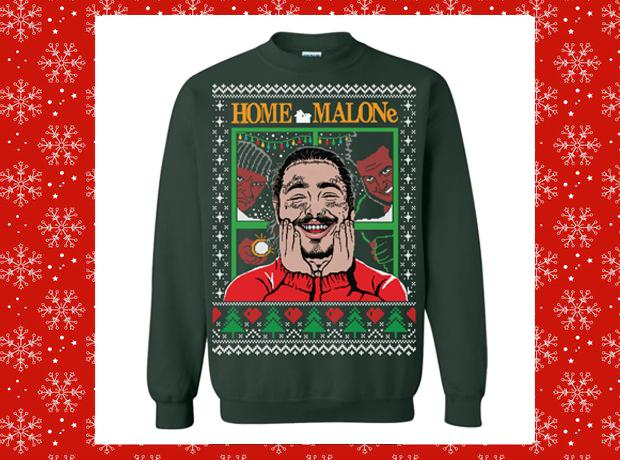 If Home Alone is your favourite Christmas film, how can you not love this Post Malone jumper? 2. A Drake Christmas jumper repping ' In My Feelings'? DRIZZY FANS ASSEMBLE! 3. Money moves...Chriasmas moves...Cardi B makes them all! Okuurrrrr!? 4. Fresh Prince fans will freak out at this festive treat! 5. What better way to celebrate Christmas than with the happiest man on earth, Yeezy? 6. What's more festive than using Christmas to remember Nicki Minaj's hilarious VMA dig at Miley Cyrus. 7. Never mind 'NY State Of Mind', we're getting in a Christmas state of mind with this Nas jumper. 8. If 'Straight Outta Compton' is one of your favourite movies, this is the Christmas jumper for you. 9. These Wu Tang Clan jumpers are so nice we couldn't blame you for wearing them all year round. 10. You could always grab some tinsel and make your own Drake slogan Christmas jumper. 11. Tupac fans, here's a Christmas jumper you can fall in love with. 12. Kim Kardashian broke the internet with this photo, can you break Christmas dinner with the jumper? 13. Perhaps dabbing all the way to the North Pole with Santa? 14. Or doing the 'Hit Dem Folks' dance around the Christmas tree! 15. The most famous Christmas jumper of recent years, it's a replica of Beyoncé's '7/11' jumper. 16. Here's one way to make a statement with your Christmas jumper. 17. Master of wrapping Christmas presents and family joker? This Etsy jumper is epic. 18. What better way to say Merry Christmas than with Drake's 'Hotline Bling' dancemoves? 19. A Barack Obama inspired Christmas jumper? Yes please!